You have integrated your new PST ﬁle (Personal Store) after switching to a new version or after reformatting your computer. But some data, such as the email signatures, etc. is missing. 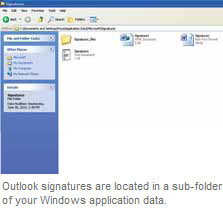 RTF ﬁ le for every signature so that it is compatible with various email formats. Go to the new system on which Outlook is installed. Depending on the OS, browse to the relevant data folder and copy the saved signature ﬁles. If a sub-folder is required and there isn't one, create it. The next time you compile a message, you will see the signatures again. For automatic application, open a new message. Click ‘Signature’ in the menu bar and then click ‘Signatures’. You can then select and edit signatures individually in the next dialog box. Deﬁne the default in the upper right combination ﬁelds. Under that, you can deﬁne different signatures for ‘New Messages’ and for ‘Replies/Forwards’. Repeat the process for all other mail accounts. Click ‘OK’ to apply the conﬁguration. NOTE: You can use the same procedure to adopt templates from your old Outlook version. The required ﬁles are located in the ‘Templates’ sub-folder now instead of the ‘Signatures’ sub-folder but in the same location in the directory structure. Copy all the existing OFT ﬁles from there and paste them in the new system.